This book comprises material on colour which was written by Wittgenstein in the last eighteen months of his life. It is one of the few documents which shows him concentratedly at work on a single philosophical issue. The principal theme is the features of different colours, of different kinds of colour (metallic colour, the colours of flames, etc.) and of luminosity—a theme which Wittgenstein treats in such a way as to destroy the traditional idea that colour is a simple and logically uniform kind of thing. 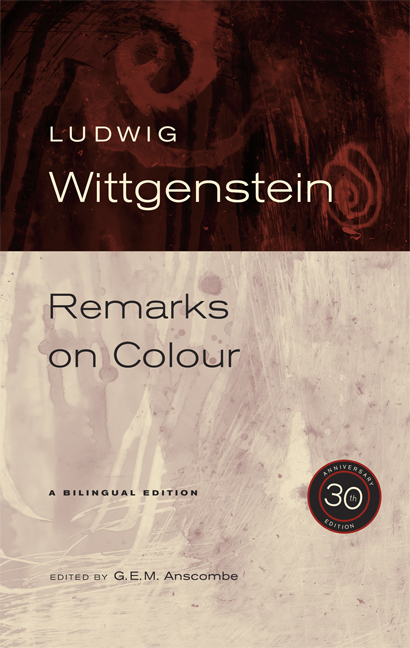 This edition consists of Wittgenstein's basic German text, together with an English translation.